After being thwarted for the past five years, Shoreline’s Rat City Rollergirls All-Star Team will make their triumphant return to the Women's Flat Track Derby Association (WFTDA) Division 1 International Championships on Friday, November 8 in Milwaukee, WI. Rat City will be one of twelve teams competing to bring home The Hydra Award Trophy. They face off against Ohio Rollergirls Friday evening and the rest of the weekend will follow the fate of winners and losers according to the bracket. "This game [against Ohio] will make us or break us,." said Rat City's All-Star Skater, Jukesapose. "It's going to take a lot of work to beat Ohio and if we succeed there, then we get to face the no. 1 team in the world - Gotham Girls from NYC." Rat City All Stars captured four wins, and suffered four loses this year against some of the top teams in the world: London, New York and Montreal among others. Seattle's roller derby team won their seat in Championships after placing third last month in Division 1 play offs in Salem, OR after bankrupting. The All Star team is comprised of the toughest, most-competitive skaters from the league's home teams. Longtime Seattle derby stars Carmen Getsome, Jalapeño Business and Luna Negra team up with new transfers Jukestapose and Sintripetal Force to bring this world powerhouse to the track. Defensive strategy, jammer agility and team-wide determination characterize this year's All Star team. The Rat City Rollergirls (RCRG) is Seattle’s premiere all-female, flat-track roller derby league. 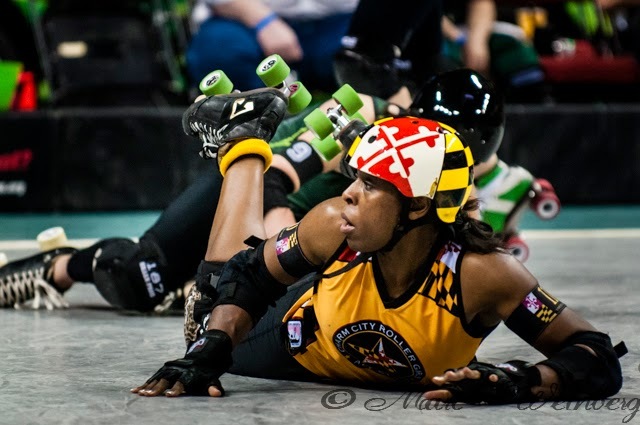 RCRG is composed of about 80 active skaters and many more retired skaters who are actively involved in the organization. The skaters are divided among four home teams: Derby Liberation Front, Grave Danger, Sockit Wenches, and Throttle Rockets. In addition, a small number of skilled, dedicated skaters are chosen to represent the league on an expanded elite A/B team, called the Rat City Rollergirls All Stars. With lightning-fast jammers and a swarm of precision blockers, the women of Rat City have taken the international derby scene by storm, placing well in WFTDA-sanctioned tournaments and maintaining a ranking among the world’s top derby teams. RCRG has consistently graduated to larger and larger venues, finally finding a home at KeyArena, home of the Seattle Storm WNBA team and former home to the Seattle Sonics NBA team. Rat City Rollergirls will be hosting a viewing party to watch the Rat City All-Stars take on Ohio in the WFTDA Championship bracket! Come join in on the fun!